An unguarded strength is a double weakness. One of the more common strengths parents want their children to have is education. If the parents are not wise in how they try to create this passion in their child, they can set the child up for a lifetime of relational failure. Sara is 13-years old and has been acting out recently. It has been mostly anger and a sassy attitude toward her parents and little brother, Michael. She added how Sara had not been eating and may be struggling with anorexia. Her mom noted how her anger had escalated over the past year and she does not know what to do about it. She talked to her husband Ryan, as well as her teachers. Typically, when mom or dad come to me for counseling regarding one of their children, there are some specific questions I need to ask the parents, about the parents. A 13-year old child does not typically become as rebellious as what Emily was describing regarding her daughter without assistance. In most cases of teen rebellion, this is more than just a child problem. I reject the cultural lie that says the teen years are predetermined to be years of rebellion, and there is nothing you can do about it. Christians can factor in the transformative power of the gospel into people’s lives, which is the perfect cure for rebellion, regardless of the age. Though there are exceptions in that some children rebel without the aid of their parents, more times than not there are things the parents have been doing that facilitated the teen’s rebellion. As things turned out for Sara, there were some specific things Emily and Ryan could have done differently. In this case, it was a kid problem and a parent problem. The interesting thing about this situation was that Emily knew it was a parent issue, but would not admit it at the beginning of our counseling session. She presented the case as though it was “all about Sara” and what they needed to do about it was befuddling to them. In the end, Emily did not want to tell me how her husband was a significant culprit in Sara’s rebellion because Emily felt hopeless that Ryan would ever change. Rather than being honest with me about the situation, she presented it as teen rebellion and wanted me to fix her daughter. Counseling was a last-ditch effort for a mom who fell between a rock and a hard place. She could not change her husband, so she hoped she could hire me to fix her broken daughter. I understood her hopelessness, but there was no way to skirt around the parenting problem. Her husband was part of Sara’s problem, and as long as he was unchanging, it was going to have a distinguishable impact on how Sara chose to live through her teenage years. It is like trying to lose weight while stuffing down a six-pack of soda and three Snicker bars a day. You cannot maintain the wrong kind of behavior and expect a different result. Ryan and Emily could not continue in their habits, especially Ryan’s, and hope Sara changes magically. 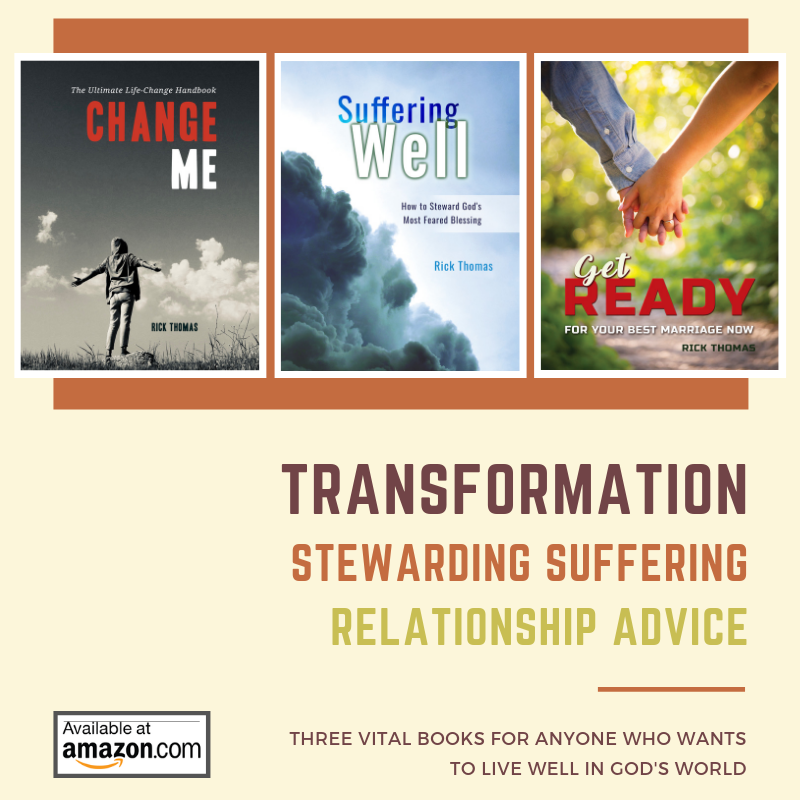 Counseling was never intended to do what Emily wanted it to do. If the grace of God were to intervene mercifully, it would be within the scope of God’s domain and prerogative, not mine. God’s grace can overcome our foolishness, but we are never to presume on His grace to do that (Psalm 19:13). During our counseling time together, I began asking Emily some specific questions. You talked to her teachers, what did they say? Emily told me that Sara’s teachers were surprised she was rebellious. Their perception of Sara was that she was a model child. In fact, Emily talked to six of her teachers from this year’s class as well as some of her previous teachers. All six of them, past and present, had similar stories: Sara is a wonderfully compliant child. She has never caused a minute’s trouble and is an academic example to all of her classmates. The real truth about Sara is that she is rebellious in every area of her life except school. The school is the only place where she is a model child. This information was helpful on several fronts. First of all, it told me that Sara could behave. There was some character issues in play, rather than physical limitations. Sara could be nice if she wanted to be nice and she could misbehave if she wanted to misbehave. She had the “moral ability” to choose right or wrong behaviors. What does your parenting model look like in your home? Emily told me that she spends most of her time with Sara while Ryan spends most of his time with Michael. She was not sure why it was that way, but that is how they have always done it. Will You Love Me Too? The effects of their parenting stirred an instructive question from little Sara. She was struggling with a situation that would soon set the trajectory for the rest of her life, though she did not know it then or now. Emily did not know the significance of Sara’s question about her daddy, though she was beginning to understand now what Sara has been harboring in her heart all these years. What does Ryan’s relationship with Sara lack? Emily said Ryan rarely encourages his daughter. Though their home is not overly negative or discouraging, it is not a home where active and intentional building up and encouragement takes place. After spending time chatting with Sara, it became apparent that affection and attention from her daddy were paramount. From her perspective, Ryan seemed preoccupied, disinterested and distant. At times, he even came across as angry, according to Sara. Sara assumed as a young child that if something terrible ever happened to their family, Michael would be okay. He would be safe, but she was not as confident daddy would protect her. It was incredible. Sara’s eyes began to water immediately. She had already figured it out: “Daddy loves Michael, but he does not love me.” Her dad’s lack of activity in her life created confusion in her heart. She was set up for personal failure. The results of their parenting also explained why she was so angry. Then she hesitated but finally murmured that her daddy rarely encouraged her and how she always felt he was displeased with her. She did clarify how many times it was not necessarily because of what he said, as much as it was about his quietness, distance, pre-occupation, and obvious affection for Michael. The church was one of the many contexts where Sara was rebellious. She hated church. The parent’s response to her “hatred of religion” was to press the issue. They saw it as another aspect of her overall rebellion they could change through force. Sadly, they were not discerning the real problem. The reason Sara rebelled was that it was her way working through her struggle with God. She did not know how to have a relationship with God because the primary authority figure in her life–her father–demotivated her to want to have a relationship with another father. Sara felt her dad’s displeasure and naturally assumed God’s anger. “If daddy does not like me, God must not like me either. There must be something wrong with me.” She believed God was angry with her. From her perspective, it was like being thrown in a room with an angry person, so Sara became angry too. She said God seemed distant to her and she did not know where she stood with Him. Though she believed God saved her when she was nine-years-old, there was still this inward awkward nagging and uncertainty about her relationship with God. Sara said she felt as though she needed to perform for God to be in good standing with Him. Though she knew her thinking was not correct, there was still this yearning in her heart to do right to be accepted by God. One of the things her mother said to me was that Sara learned in Kindergarten that she was smart. Shortly after entering Kindergarten, Sara found her niche in life. Sara had a gift, and that gift was her intelligence. Yes, Sara is a bright girl. When she began turning in her papers to Mrs. Garrison, her first-grade teacher, the papers would come back with stars and smiley faces at the top of them. How she felt in those moments of getting her papers back was something she rarely felt at any time in her life. Sara felt appreciated. She felt loved. She felt approved. Daddy told me a long time ago the best way I could make him happy was to make all A’s. Daddy doesn’t care for lack of effort, particularly when it comes to school. He said when he was in school he did not try hard and it was the worst mistake of his life. He does not want me to do poorly in school. Sara took his warning to heart, and from her perspective, she saw it as a fortunate thing to be a bright girl. She saw it as a gift, though it blinded her to how her greatest strength was also her biggest weakness. The real truth was that neither she nor her father and mother could see how her pursuit of good grades and excellence through education was idolatry. Sara was an idolater, and her daddy was one of the culprits who was pushing her deeper into her idolatry. The more we talked, the more open Sara became. She eventually shared with me how on one occasion last year she cheated on a test. I was the first person she ever let in on her secret. Sara was so hungry for attention from her dad that she rationalized the cheating. Her guilt-ridden conscience had been eating away at her for over a year, but her craving for love was more significant than her temptation to sin. Her guilty conscience was another reason she had an aggravated relationship with God, and with most everyone else in her life. She was getting the love she craved through academic success, but in her heart of hearts, Sara knew she was getting her “fix on” at a high price. Her frustration mounted. To make matters worse, the unresolved guilt in her conscience began to work out in anorexic tendencies. She could not tell anyone what she had done, but Sara knew there had to be some punishment for her sin, so she punished herself. Dad was distant, so she could not tell him. God was displeased with her, so He could not help her. Therefore, she chose to punish herself by not eating. Self-atonement: a desire to punish herself through fasting as a way to soothe her guilty conscience. Self-centeredness: a desire for love, which she could attain through her grades, even if it meant cheating. Sara’s idolatrous craving for excellence, as defined by her dad, led her into an isolated, individualistic, and competitive way of thinking and behaving. The irony of it all was at the end of each semester Sara would bring her report card home to rave reviews, the applause she longed to receive. Grandpa was happy. Grandma was happy. Daddy was happy. Mom was happy. Sara was temporarily happy with their approval, but the gnawing away of her soul was an inconsolable burden that led to “uncharacteristic” acting out behavior. Sadly, her daddy was applauding her excellence, while perplexed by her weight loss, oblivious to the real longings of her soul, and aiding her in the ongoing ensnaring to idolatry. How Would You Counsel This Situation? How would you counsel Sara? How would you advise Emily? How would you counsel Ryan? To learn how to help this family, I recommend you read the three articles linked at the top.